The graph covers December 1990 to March 2008. Wonder about that one, single website back in December of 1990? That was info.cern.ch, the first-ever website and web server, created by Tim Berners-Lee (inventor of the WWW). It’s amazing how the web has gone from consisting of just this first little web page to the huge network of millions and millions of websites that it is today, and how pervasive the web has become in our society. We do our banking online, read our news online, have our encyclopedias online, meet friends online. And all this has happened since 1990. The definition of what counts as a website varies, but the numbers here are hostnames connected to sites that respond. The numbers from Netcraft (August 1995 and onward) include parked pages as well, so it is larger than the number of “active” websites. Some of the data was taken from Hobbes’ Internet Timeline and then complemented with Netcraft data. Could you make a logarithmic graph with the same data. That would be interesting to see. 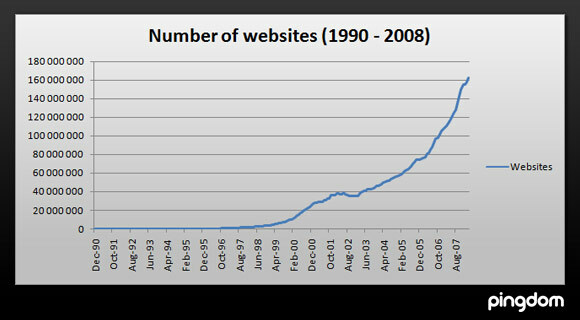 Note that 3 out of 4 sites came online after the “boom” of 2000, and the “bust” only flattened the growth for about 18 months. But how many are worth visiting? Answer, not very many indeed. Interesting statistics on the number of new websites…….it should be interesting to see the growth in the next 5 years.